Tomorrow is Halloween and we have a porch full of squash and pumpkins. We’ll be offering trick-or-treaters mini pumpkins along with candy. I’ve played around with this recipe several times and encourage you to do the same. This makes more than enough to fill any but the thinnest shelled pumpkin. Take a large lidded skillet and cook sausage slowly and gently so it release as much fat as possible. Break it up as it cooks into small pieces. When done mop up any fat with one or two paper towels, pressing down lightly on sausage or turkey to release fat. When meat is defatted add onion and gently cook about 5 minutes when it should turn translucent. Add rice and stir for a couple minutes then add liquid and cover with lid, turn stove top temperature to low. After ½ hour add remaining ingredients without stirring. Cook for another thirty minutes, stir ingredients together and stuff pumpkin. 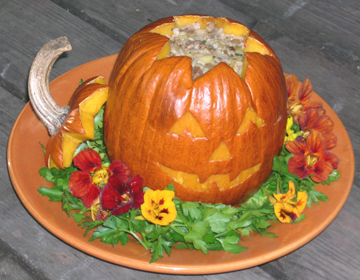 Cook stuffed pumpkin for one hour twenty minutes in a 350 degree oven. A couple of indications of being fully cooked is a little juice emerges around the lid and the rind has a slight give when touched. Your pumpkin should be carefully washed and dried before the lid is cut free. Scoop out all the seeds and loose fibers from inside the pumpkin. Once it is stuffed place it on a cookie sheet. I make a sort of sling with two straps of folded foil that I use to move the cooked pumpkin to a platter. The foil keeps the base from over cooking and helps me avoid any tendency to klutz during one of those tense critical moments in the kitchen. I also wrap the stem in a couple layers of foil, shiny side out so it doesn’t burn. If you’re feeling artistic and in the spirit of Halloween it can even have a face. Just carefully cut the design and peel away the skin leaving the gold orange flesh glowing beneath. Slice into wedges to serve. Thanks, I think your idea of making a pie in a pumpkin, pretty creative and worth trying. Can you eat the whole pumpkin (I’m mostly curious about the skin)? Or do you just eat the stuffing? I want to make something like this for a friend who is vegetarian. I’ve eaten some of the outer skin and it’s a little tough, certainly edible, but nothing special. I always eat the rind, the fleshy portion.